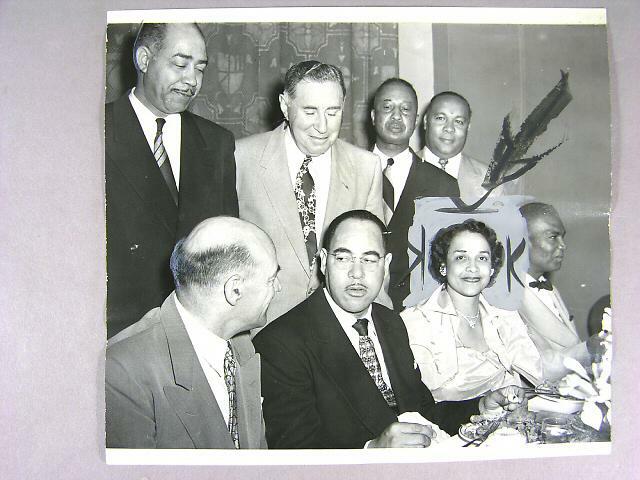 The major caption posted on the back of this image dates from April 20th, 1953: "Special guests at a dinner honoring Assemblyman W. Byron Rumford were (seated left to right) Supervisor Kent Pursel; Rumford, Mrs. Rumford and Solomon Hill and (rear) Vernon G. McCalla, Fred Swan, D.G. Gibson and Aramis Fouche. Rumford was honored at the testimonial before his departure on a State Department European tour. They seem to be eating chikcen. In addition, the politicians are both African-American and white.